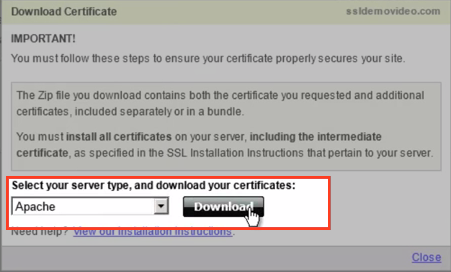 This article outlines the process of renewing an SSL certificate for your Apache or Anchor server. For instructions on configuring a new SSL certificate, please reference the How to Configure a Single Domain SSL Certificate or a Wildcard Certificate Knowledgebase article. Navigate to your chosen SSL Certificate Authority (for example, GoDaddy, Thawte, Verisign, and so forth) and log in. Each of these Certificate Authorities will provide a specific set of steps for renewing an SSL certificate. For example, you might need to re-submit your .csr file located in your Apache directory (for example,C:\Apache24\bin\ssl\_.yourdomainname.com.csr); or, your Certificate Authority might already hold a copy of this file in their system. When this process is complete, your SSL Certificate Authority will provide you with two updated files: a .crt file and a bundle.crt file. Make sure that you specify Apache server type when you download the files. After your SSL Certificate Authority provides you with the .crt file and the bundle.crt file, move the files into the C:\Apache24\conf\ssl\ directory. Restart your Anchor Server Service. If you use an SSL certificate for your Anchor server—for example, for WebDAV support—you will also need to periodically renew the SSL certificate for your Anchor server. After you receive your renewed .crt file and bundle.crt file, you will need to COPY the following two files from your Apache folder (for example, C:\Apache24\conf\ssl) and PASTE them into your Anchor conf folder (for example, C:\Anchor Server\conf folder). Open the newly copied .crt file, select all of its contents, and then COPY its contents. Open the newly copied bundle.crt file and place your mouse cursor at the beginning of the document (before the first character). PASTE the contents of the .crt file into the top of the bundle.crt file. Save the modified bundle.crt file. Open your C:\Anchor Server\conf\config.ini file. Under the [server] heading, change the following value to point to your new combinedbundle.crt.